An important new report by the Chicago-based civil rights organization Center for New Community (CNC), released yesterday, documents collusion between the leadership of U.S. Border Patrol Unions and the organized anti-immigrant movement in the United States. 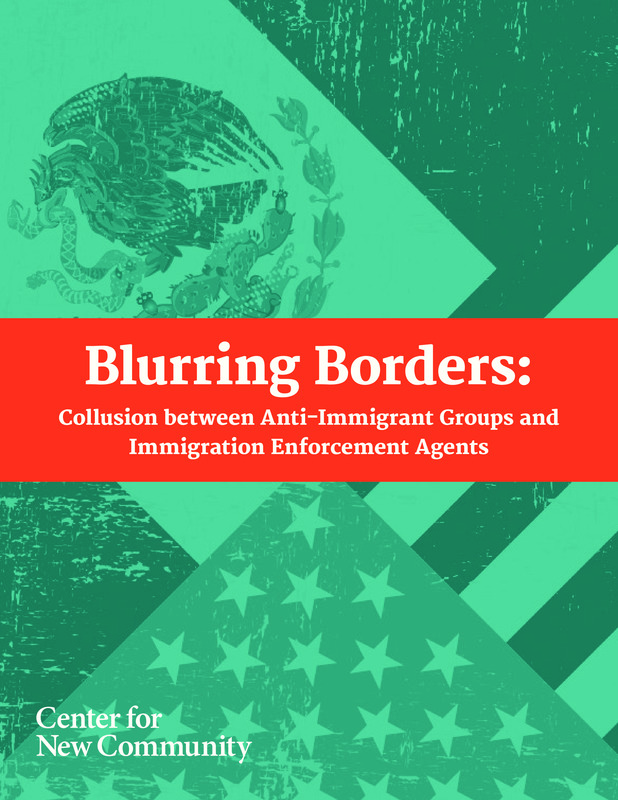 The report, “Blurring Borders: Collusion between Anti-Immigrant Groups and Immigration Enforcement Agents” documents numerous examples of this collusion, and notes how extremely problematic it is when you consider the fact that Border Patrol agents are entrusted to carry out the country’s immigration policies as instructed by Congress and the Executive branch. The report reveals that the anti-immigrant movement is actively engaged in developing sources within these agencies and unions who are willing to leak data directly to them, and cultivating spokespersons from within these unions who are willing to echo their messaging and to advocate for their policy goals. One year ago today, anti-immigrant protesters in the town of Murrieta, Calif., blocked busses carrying some of the thousands of women and children who were fleeing violence in Central America. As the report notes, the activists would not have known about the busses coming to Murrieta if it were not for Border Patrol agents leaking the information to anti-immigrant leaders. The report also notes that a close working relationship with Border Patrol and other government agencies is part of the broader anti-immigrant strategy, one developed over three decades ago by white nationalist John Tanton, the founder of the modern nativist movement. Today, the anti-immigrant groups rely heavily on these agencies to provide them with information. The Center for Immigration Studies (CIS), a group founded by Tanton, is one of the groups that benefits the most from this collusion. Stephen Steinlight, senior policy analyst for CIS, acknowledged during a radio interview in 2014 that many CIS publications would not be possible “without our ongoing good connections with whistleblowers in agencies like Immigration and Customs Enforcement." To read CNC’s report in full, click here.